Sinevibes' most brutal plugin yet, Malfunction brings controlled destruction to the (Mac-based) studio. Effective sound-masher. Goes from extreme to ridiculous. Circuit-bent filter can self-oscillate. LFO generator adds rhythmic interest. Effect is controllable despite its intensity. So cheap! There are countless plugins on the market whose sole purpose is to take your pristine audio clips and reduce them to the very epitome of quivering distress. Now, with Sinevibes' new Mac Audio Units plugin, Malfunction, we have another set of thumbscrews with which to mete out cruel and unusual treatment to our samples and recordings. "Malfunction is not an effects processor for the faint-hearted"
As Sinevibes' description of it - a "circuit-bent filter" - suggests, Malfunction is not an effects processor for the faint-hearted. 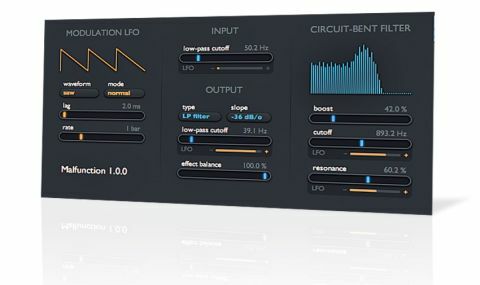 The plugin features three discrete filter stages: a low-pass filter at the input stage feeds said "circuit-bent" low-pass filter, which in turn feeds a multi-mode output filter. The signal is then mixed with the dry source via a wet/dry balance control before being sent to the plugin's output. The circuit-bent filter is a special low-pass filter algorithm in which, in simple terms, the internal connections have been deliberately messed up so that it doesn't operate in the regular fashion. In analogue terms, it's akin to a broken filter circuit that happens to produce a particularly usable and controllable sound. As ever with Sinevibes plugins, the GUI is spacious and uncluttered, with the controls for each component grouped together in a logical way. However, we do feel that the layout of the window could reflect the signal flow rather better, and that the dark grey titling and parameter value displays are a bit too subtle to be immediately legible against the even darker grey background. What isn't subtle, though, is Malfunction's sound. The circuit-bent filter dominates proceedings, of course, even when gentle settings are applied - so much so, in fact, that the effect of the input filter (especially when it's not being modulated) is largely overpowered by the harmonic distortion introduced by the circuit-bent one. The circuit-bent filter itself produces a range of distortion tones, from fuzzy and warm all the way to screaming self-resonance; at extreme settings, the sound can be smashed down to little more than a choked hiss or buzz. The multimode output filter is essential for taming the wild intensity of the circuit-bent filter. It can be switched between low-, high- and band- pass modes, and offers 12, 24, 36 and 48dB/ octave slopes. Finally, the dry/wet balance control is particularly useful given the severity of Malfunction's sound-mashing - you'll often want to have some of the original signal mixed in with Malfunction's screeching and growling! "It is an interesting and controllable take on audio mangling"
Our biggest gripe with Malfunction, really, is that it's AU-only. The reason for this is that Sinevibes are focused on developing native tools for OS X and iOS, and the only major VST-only DAW host on Mac is Cubase. That being the case, they prefer to expend their efforts on producing new and exciting products for their platform of choice, rather than spending time porting their AU offerings to VST. We understand and accept the logic of this, but are still surprised to see VST's cross-platform/cross-host ubiquity sidelined. Not to mention PC versions! Malfunction is an interesting and controllable take on audio mangling, albeit with an interface that could be a little more intuitive. At $19 (less than £13 at the time of writing), it's also a veritable bargain, not to mention a lot of fun. One for all Mac musicians to check out, then.